Guante: first reviews of the new album! "Part Cormac McCarthy, part Woody Guthrie, and part Public Enemy, An Unwelcome Guest is an intricately woven poetic and sonic excursion through landscapes mental, emotional, and physical, cementing Guante and Big Cats! 's status as two of the best emerging artists within Twin Cities hip-hop." 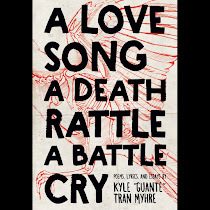 "Fortunately, Guante has a deft sense of humor and style in his arsenal, along with a battle-hewn tongue that rattles off sharply-spit rhymes and high-concept narratives. His upcoming album An Unwelcome Guest tells the story of a traveler's fight against a zombie horde (stop me if you've heard that one before), but Guante's lyrics go deeper than the familiar comic-book premise into an authority-questioning meditation on violence that'd do John Romero's most allegorical moments proud. And Big Cats, his production partner on the new album, has the kind of chops that can only add to the atmospheric resonance."